Martel & Mitchell Physiotherapy is pleased to offer aquatic physiotherapy at our North Bay location in our private on-site therapy pool. Leading physiotherapists around the world are using water’s unique properties of buoyancy and viscosity to successfully rehabilitate clients. In water you can begin your rehab sooner and with less pain! After an assessment by one of our physiotherapists, our certified Aquatic Therapist, Stephanie Horsman, a Registered Kinesiologist with special training in Aquatic Therapy, works with you during your one-on-one aquatic therapy sessions. 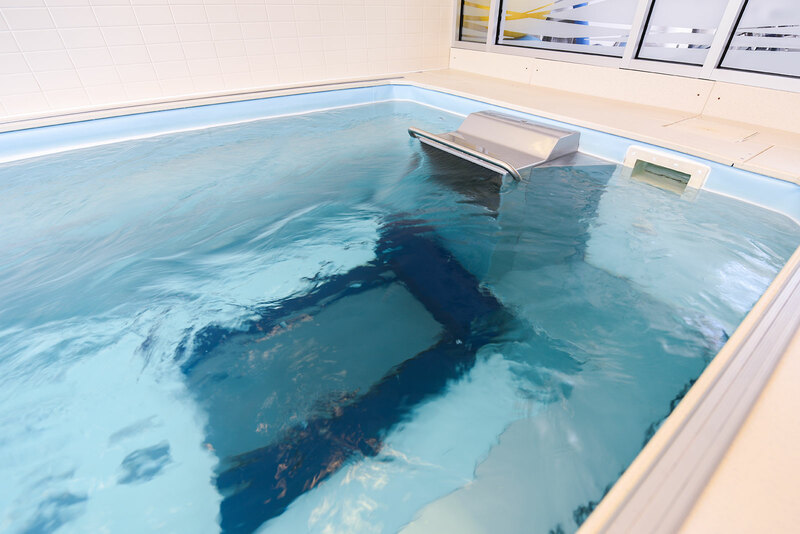 Our therapy pool is 48 inches deep and is heated to 91 degrees to provide therapeutic warmth to sooth sore, stiff joints. It has a continuous current that can be increased or decreased in speed to create resistance depending on the therapeutic need. The therapy pool also has an integrated treadmill that allows our clients to walk or run in a reduced weight bearing environment. We use the current and treadmill in combination for gait training and conditioning which allows our clients to exercise and return to their pre-injury status earlier and with less pain! Our clinic respects your need for privacy and comfort. Our individual change rooms include their own clean, private shower and hair dryer and they open directly into the pool area so there is no need to walk through the rest of the clinic. Our pool area is completely wheelchair accessible with a built-in lift for those with decreased mobility.